Expanding the ancient practice of sacred reading beyond scriptural texts to include visual art, music, nature and your own sacred stories. Lectio divina, which means sacred reading, is an ancient contemplative practice of listening deeply to the voice of God in sacred texts. In recent years there has been a reclaiming of the riches of contemplative prayer forms of Western traditions. 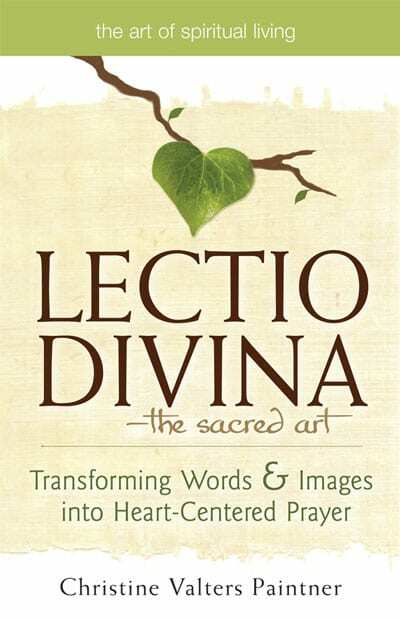 Through the practice of lectio divina you become present to each moment in a heart-centered way. Gradually, the practice of lectio expands your capacity to sense God’s presence until all of life becomes a cascade of prayer. It is wise to hold all of these worthy goals with humility. Benedict describes his rule of life as a “little Rule for beginners,” and because we are human we will continue to stray from the path we most deeply long for. Life will intervene and throw us off track. We will need to bring ourselves back again and again to the practice. In Wherever You Go, There You Are, Jon Kabat-Zinn writes that doing yoga and not doing yoga are the same. What he means is that sometimes when we return to our practice after having left it for several days (or weeks, months, years) we often have a deeper appreciation for what we have lost than if we had not strayed. “Always we begin again” are perhaps the four most important words to me in Benedict’s rule, and I repeat them often to my students in contemplative practice. Beginning again is essential. We fall away, we lose our will to persevere for so many reasons. The problem is not with the waning of our inner fire and perseverance, but with not returning again at all. When we realize we have not meditated in days, and so our minds have become hard with judgment and self-criticism, we find ourselves even further from the peace we might experience than if we had simply returned to practice without anxiety. Kabat-Zinn also asks, “Can you see that not practicing is an arduous practice?” What he means is that we each have a life practice, although it may not be conscious or intentional. When we cultivate compassion and peace in ourselves through lectio divina, meditation, chanting, yoga, or any number of possible practices, it spills over into the rest of our lives. When we have no intentional practice, we may move through life full of anxiety and resentment, with no way to hold grief and the struggles of life. To have no practice becomes the most arduous kind of practice. When we remember this, returning to our practice comes with greater ease because we recognize how much harder life is without it. The underlying assumption of lectio divina is that the whole world is, in fact, a text of sacred revelation. All experience has the potential to be revelatory, and God is singing one unending song, seducing each of our hearts, so the call is to listen, to attune ourselves to the words God utters into the world. As we have discovered in this book, the way God speaks is elusive and often mysterious, for God’s voice is the language of dreams and landscapes, of art and music, of dancing and poetry. It does not lend itself easily to a world conditioned to sound bites. In moments of simple kindness and compassion, in the quiet knowing of my heart’s desires, in the profound impulse toward life in every moment, even in my weeping, which witnesses to my capacity for great love, I don’t ask whether God is speaking. I ask whether there can be any place void of this sacred song.